Свои отзывы о moneyworks.pro можете оставлять в комментариях под темой. The amount of 20 USD has been withdrawn from your account. Accounts: U1****->U18879698. Memo: Shopping Cart Payment. . Date: 04:59 20.02.19. Batch: 247198268. Ежели так, то почему данный проект расположен в средниках? Ему самое место в фастах, если что, вроде. Коллега, читаем тему, там черным по белом сказано, тело включено в выплаты. The amount of 0.6 USD has been deposited to your account. Accounts: U18879698->U1*****. Memo: API Payment. https://moneyworks.pro.. Date: 08:46 21.02.19. Batch: 247365617. The amount of 0.6 USD has been deposited to your account. Accounts: U18879698->U1*****. Memo: API Payment. https://moneyworks.pro.. Date: 05:00 22.02.19. Batch: 247481693. 02.22.19 09:37	Account	Receive	+3.00	Received Payment 3.00 USD from account U18879698 to account U17755**. Batch: 247511125. Memo: API Payment. https://moneyworks.pro. The amount of 0.6 USD has been deposited to your account. Accounts: U18879698->U1*****. Memo: API Payment. https://moneyworks.pro.. Date: 05:01 23.02.19. Batch: 247613584. The amount of 1.5 USD has been deposited to your account. Accounts: U18879698->U6977456. Memo: API Payment. https://moneyworks.pro.. Date: 08:19 22.02.19. Batch: 247500960. The amount of 1 USD has been deposited to your account. Accounts: U18879698->U6977456. Memo: API Payment. https://moneyworks.pro.. Date: 08:30 22.02.19. Batch: 247502167. The amount of 5 USD has been deposited to your account. Accounts: U18879698->U6977456. Memo: API Payment. https://moneyworks.pro.. Date: 16:13 22.02.19. Batch: 247561630. The amount of 2.5 USD has been deposited to your account. Accounts: U18879698->U6977456. Memo: API Payment. https://moneyworks.pro.. Date: 19:11 22.02.19. Batch: 247580365. The amount of 1.5 USD has been deposited to your account. Accounts: U18879698->U6977456. Memo: API Payment. https://moneyworks.pro.. Date: 01:36 23.02.19. Batch: 247603783. 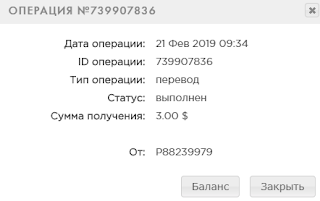 02.23.19 09:36	Account	Receive	+3.00	Received Payment 3.00 USD from account U18879698 to account U17755***. Batch: 247639759. Memo: API Payment. https://moneyworks.pro.